Bangladesh is a country in South Asia. It is bordered by India on all sides except for a small border with Myanmar to the far southeast and by the Bay of Bengal to the south. 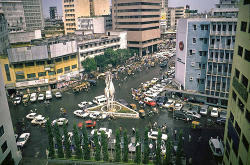 Bangladesh is among the most highly and densely populated countries in the world. Bangladesh is a secular parliamentary democracy. Despite sustained domestic and international efforts to improve economic and demographic prospects, Bangladesh remains a developing nation, in part due to its large population. Health and education levels have recently improved as poverty levels have decreased. Nevertheless, Bangladesh remains among the poorest nations in the world. Europeans began to set up trading posts in the area of Bangladesh in the 16th century; eventually the British came to dominate the region and it became part of British India. In 1947, West Pakistan and East Bengal (both primarily Muslim) separated from India (largely Hindu) and jointly became the new country of Pakistan. East Bengal became East Pakistan in 1955, but the awkward arrangement of a two-part country with its territorial units separated by 1,600 km left the Bengalis marginalized and dissatisfied. East Pakistan seceded from its union with West Pakistan in 1971 and was renamed Bangladesh. Bangladesh remains one of the world’s least developed countries, which makes it an ideal setting for studying development and a primary reason for locating the internationally funded and maintained Asian University for Women here. Although more than half of GDP is generated through the service sector, nearly two-thirds of Bangladeshis are employed in the agriculture sector, with rice as the single-most-important product. Major impediments to growth include frequent cyclones and floods, inefficient state-owned enterprises, inadequate port facilities, a rapidly growing labor force that cannot be absorbed by agriculture, delays in exploiting energy resources (natural gas), insufficient power supplies, and slow implementation of economic reforms. Reform is stalled in many instances by political infighting and corruption at all levels of government. Opposition from the bureaucracy, public sector unions, and other vested interest groups also have blocked progress. The BNP government, led by Prime Minister Khaleda ZIA, has the parliamentary strength to push through needed reforms, but the party’s political will to do so has been lacking in key areas. On an encouraging note, growth has been a steady 5-6% for the past several years. Bangladesh is located in the low-lying Ganges-Brahmaputra River Delta or Ganges Delta. This delta is formed by the confluence of the Ganges (local name Padma or Pôdda), Brahmaputra (Jamuna or Jomuna), and Meghna rivers and their respective tributaries. The alluvial soil deposited by these rivers has created some of the most fertile plains in the world. Bangladesh has 58 trans-boundary rivers, making water issues politically complicated to resolve – in most cases as the lower riparian state to India. Most parts of Bangladesh are less than 12 meters above the sea level. The highest point in Bangladesh is in Mowdok range at 1,052 meters in the Chittagong Hill Tracts to the southeast of the country. A major part of the coastline comprises a marshy jungle, the Sundarbans, the largest mangrove forest in the world and home to diverse flora and fauna, including the Royal Bengal Tiger. Straddling the Tropic of Cancer, Bangladeshi climate is tropical with a mild winter from October to March, a hot, humid summer from March to June. A warm and humid monsoon season lasts from June to October and supplies most of the country’s rainfall. A new state for an old nation, Bangladesh has a culture that encompasses elements both old and new. The Bengali language boasts a rich literary heritage, which Bangladesh shares with the Indian state of West Bengal. The earliest literary text in Bangla is the eighth century Charyapada. The musical tradition of Bangladesh is lyrics-based, with minimal instrumental accompaniment. There are numerous musical traditions in Bangladesh, which vary from one region to the other. Similarly, Bangladeshi dance forms draw from folk traditions, especially those of the tribal groups, as well as the broader Indian dance tradition. Bangladesh produces about 80 films a year. Mainstream Hindi films are also quite popular, as are films from Kolkata, which has its own thriving Bengali-language movie industry. The culinary tradition of Bangladesh has close relations to Indian and Middle Eastern cuisine as well as having many unique traits. Rice and fish are traditional favorites. The sari (shaŗi) is by far the most widely worn dress by Bangladeshi women. However, in urban areas some women wear Western attire. Among men, European dressing has greater acceptance. The longyi is widely worn by Bangladesh men as in Myanmar. Cricket is one of the most popular sports in Bangladesh; other popular sports include football, field hockey, tennis, badminton, handball, volleyball, chess, carom, and kabadi, a seven-a-side team-sport played without a ball or any other equipment, which is the national sport of Bangladesh. International high quality education in Bangladesh is rare and is a reason for locating the Asian University for Women here. When opened in 2008, the Asian University for Women is meant to set an example for transforming society, starting with its role in the education sector. The educational system in Bangladesh is three-tiered and highly subsidized. The government of Bangladesh operates many schools in the primary, secondary, and higher secondary levels. It also subsidizes parts of the funding for many private schools. In the tertiary education sector, the government also funds more than 15 state universities through the University Grants Commission. The Bangladesh education board is looking forward to education as a way to provide a somewhat poverty-stricken nation with a brighter future. Bangladesh fully conforms to the Education For All (EFA) objectives and the Millennium Development Goals (MDG) and international declarations. Article 17 of the Bangladesh Constitution assures that all children between the ages of six and ten years are to be provided basic education free of charge. Bangladeshi universities turn out almost 450,000 skilled graduates annually. Undergraduate education of various duration (two to four years) is offered to age 18+ students at a number of public and private universities, degree and honors colleges, technical colleges, and specialized institutions. Successful completion of a degree course is a prerequisite for appointment to a white-collar civilian job. Post-graduate education, normally of a one- to two-year duration, is provided at universities and affiliated colleges and institutions under National University. Bangladesh provides an interesting setting for studying a multitude of issues that are similar to those found in Myanmar. In Bangladesh, one can study issues from a different viewpoint and be much more objective about solutions. Students can compare the Bangladesh situation to that experienced in Myanmar and can potentially adapt Bangladesh solutions to benefit Myanmar as well as bring Myanmar solutions to issues currently being experienced in Bangladesh.